This new Murano glass necklace features a gorgeous focal bead! The genuine Murano Venetian glass bead measures 16mm across and is round in shape. 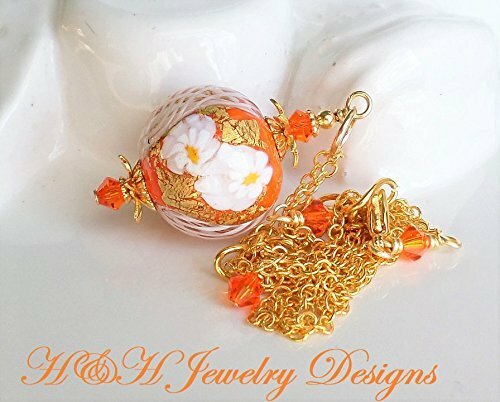 The core is done with a gorgeous bright Orange glass, decorated with white flowers, lattice work in white, and heavy layers of genuine 24KT gold foil. The beads is so beautiful and one of a kind since it is completely hand made. Above and below I have added Swarovski Crystals in a color that is retired - Red Topaz which is a wonderful match. The accents included are all done in a bright gold plated brass. The pendant is suspended from a fine but sturdy gold brass cable chain, closing with a gold lobster claw. The necklace is adjustable from 17 to 18 1/2 inches.